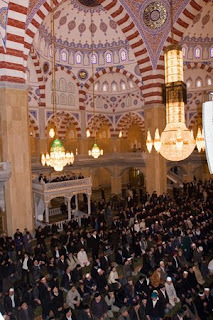 Europe's largest mosque, named after late leader Akhmat Kadyrov, opens in Grozny. The building's other name is " The Heart of Chechnya"
Opening of the new mosque took place today as part of the second conference "Islam: a religion of peace and creation", which is currently going on in Grozny. The opening ceremony, in which representatives of 28 nations participated, was broadcast live on Chechen television. 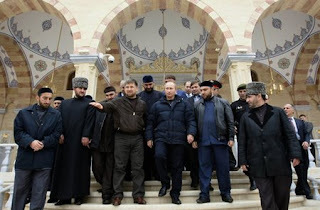 Years ago, then-leader of Chechnya Akhmat Kadyrov, visited Turkey and was impressed by one of its historical mosques. His dream was to build a similar one in his native Chechnya, and his son Ramzan Kadyrov, current President of Chechnya, has fulfilled his late father's dream. 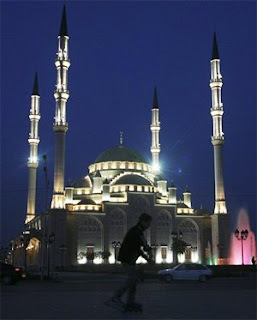 The Heart of Chechnya, or Akhmat Kadyrov memorial mosque, is the biggest in Europe, having enough room for 10,000 people. Its minarets are 62 meters tall. The mosque is a part of a larger islamic complex, which covers 14 hectares of land and includes a mufti administration complex Islamic studies institute, gardens and other facilities. Vladimir Putin, who visited the site yesterday, said Akhmat Kadyrov mosque was a "gift for the muslims of the whole world". Ramzan Kadyrov, in his tun, described Mr. Putin as "the hope and support" of the islamic world. In fact, the Prime Minister visited Chechnya not to take part in festivities, but to inspect works being done in the Republic which was hit by an earthquake on 11 October.